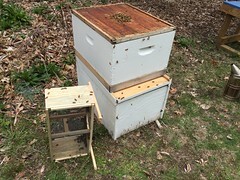 In addition to freeing my stuck queen, I also flipped the boxes on my older hive today. I did a full inspection of the hive. 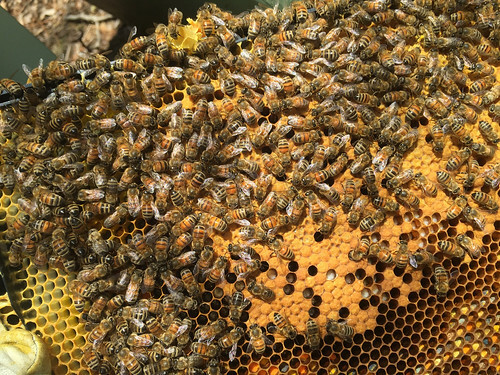 There are several frames of brood and capped brood and obviously more bees than last time. They are only using the top box and going in and out of the top hole. So, I reversed the top and bottom boxes. Probably no real need to have done this. I just thought they should be using the bottom board for entry and exit. Switching boxes gave me a chance to check the amount of honey left. Both boxes weigh about 30 lbs, I'd guess. I have plenty more honey saved for them. I'll see what things look like in a week. I think I should be doing brief weekly checks now, to make sure they don't run out of food. I'm amazed at all the different colors of pollen they are bringing in now. In the lower right corner of this picture, there are many shades of blue, orange, yellow and red. It looks like they are sorting it by color! 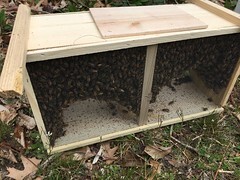 I checked on my newly installed bees this morning. The queen was still in the cage!! There was no sign that the bees were eating the candy plug at all! I can't believe it. I was so pleased that I installed the package right this time and now the bees didn't do their part! Unfortunately, it's been 4 days since I installed them. (I had a busy week.) I hope the queen is OK still. I let her out. She looked fine. Small. I think what happened is that the bees were all to busy eating all the honey and pollen I gave them and they weren't interested in the candy plug. This crazy weather has had bad consequences on many things, including bees. It's halfway into April and our weather is still chilly - rainy, dark and cold. What an odd year. After our incredibly warm February, I thought spring was here early. But now March and April have been wintry. Our early flowers were hit by frost and are now brown mush. 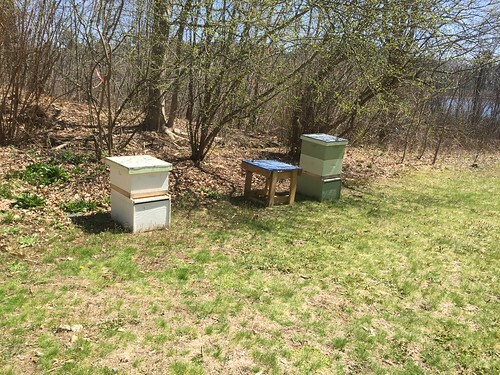 A friend of mine lost two hives recently and she said others have had the same problem. 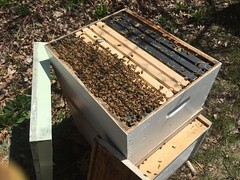 Their bees broke their clusters in February and didn't reform when the cold hit, so they died in March. 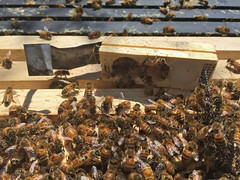 I think this happens when the queen lays early brood, the bees spread out to keep the brood warm. 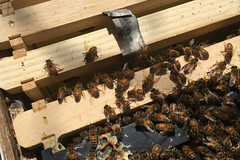 When cold hits, the bees don't know they can't keep all the brood warm, and the whole hive dies. Too bad - crazy weather. 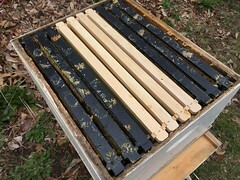 To prepare my new hive, I set up a deep box with four new frames (the ones with wood edges) in the middle and six drawn frames (the ones with black plastic edges). 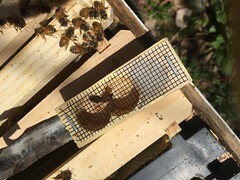 The two adjacent to the new frames were extracted, the other four were full of honey. 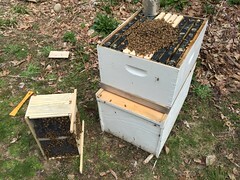 I'm glad to be able to feed the new bees honey. (It's from my hive that died in the middle of the winter.) I think they'll like this better than sugar water. They were very nice bees. I dumped them all in the box. And I put the queen in correctly. I didn't break the metal hanger or remove the wrong plug like last year. I'll check in two days to make sure she got out.